Wheems arrived to Back to Nature in April 2009. She was approximately 2-3 months old. She had been brought to the refuge by Orange County Animal Services after being kicked out of the nest by her parents. Wheems suffers from a crossed-beak birth defect. Because of the crossed beak she is unable to cut open her prey and eat it. After a month of hand feeding, Wheems was put to the test: Could she eat her food if it was cut up for her? BTN was happy to see that Wheems could indeed eat, if she was provided chopped food on a daily basis. She was then deemed non-releasable and given a flight enclosure for educational purposes. Wheems now serves as an “educational ambassador” for her species. 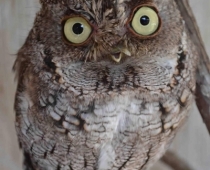 *Wheems received her name from the 1987 movie, “Batteries Not Included” because her sweet, large blinking, yellow eyes resemble that of the character in the movie. Adults range from 16 to 25 cm (6.3–10 in) in length and weigh 121-244 grams (4.3-8.6 oz)] The wingspan can range from 46 to 61 cm (18 to 24 in). They have either rusty or dark gray intricately patterned plumage with streaking on the underparts. 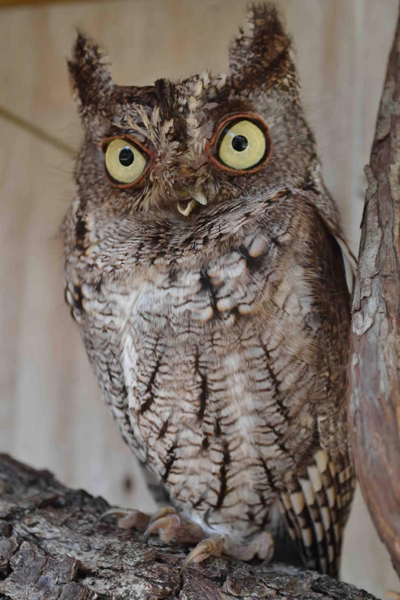 Mid-sized by screech-owl standards, these birds are stocky, short-tailed and broad-winged. They have a large round head with prominent ear tufts, yellow eyes and a yellowish bill. Rusty birds are more common in the southern parts of the range; pairings of the two color variants do occur. A pale gray variation also exists in western canada and the north-central United States. The color variations are referred to as “red morph” and “gray morph” by bird watchers and ornithologist. Their breeding habitat is deciduous or mixed woods in eastern North America. Usually solitary, they nest in a tree cavity, either natural or excavated by a woodpecker; they will also use nesting boxes. The bird doesn’t actually build a nest; instead, females lay their eggs directly on the layer of fur and feathers left over from previous meals that lines the bottom of its den. 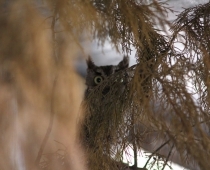 Breeding pairs often return to the same nest year after year.They are strictly nocturnal, roosting during the day in cavities or next to tree trunks. They are quite common, and can often be found in residential areas. However, due to their small size and camouflage, they are much more frequently heard than actually seen. 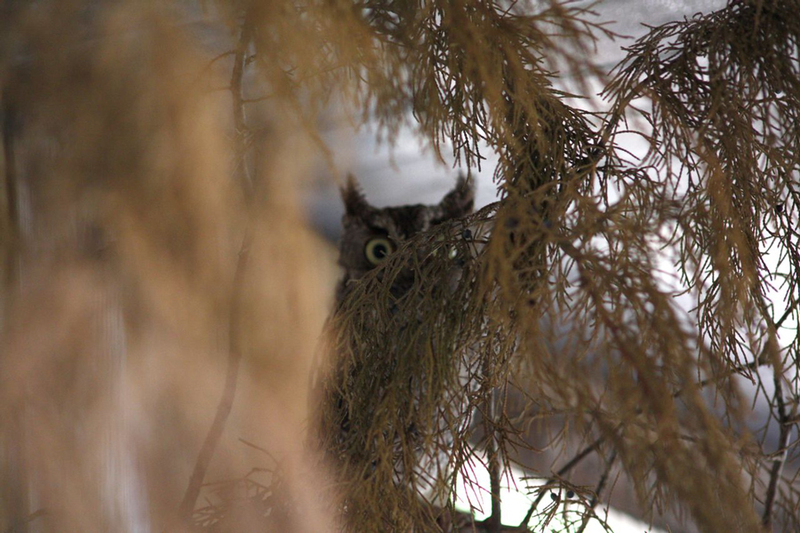 These owls are frequently heard calling at night, especially during their spring breeding season. 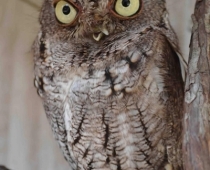 Despite their name, this owl (nor most “screech-owls”) doesn’t truly screech. 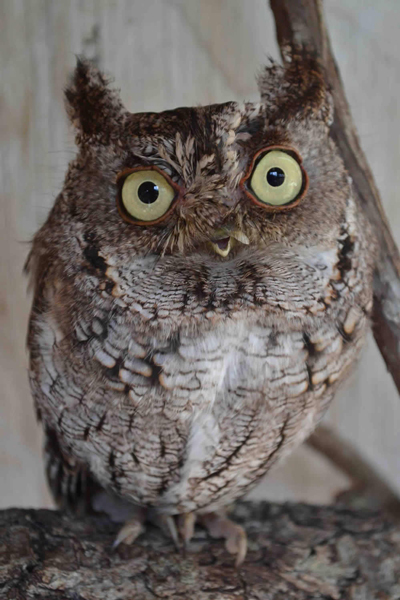 The Eastern Screech Owl’s call is an eerie tremolo with a descending, whinny-like quality, and also a monotone purring trill lasting 3–5 seconds.